One of the most common ways in which to treat endometriosis in females is through laparoscopic surgery. 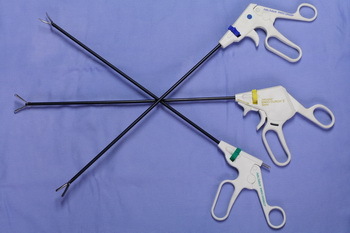 Instead of having to make a large, substantial incision in the abdominal wall a surgeon will insert a lighted viewing device called a laparoscope through a small incision into the pelvic region. If a surgeon needs better access or viewing, one or two smaller incisions might be made to insert other surgical instruments or devices. Laparoscopic surgery for endometriosis can be an eventful procedure for a woman that is trying to conceive a baby. The procedure is used to view internal female organs in order to check for signs of endometriosis and any other possible problems which could be prohibiting conception. A laparoscopic surgery is the only way a definitive diagnosis of endometriosis can be made and it can also find other abnormalities that may not be felt during a physical examination of the reproductive organs. Another advantage of laparoscopic surgery is that a physician is able to remove previous scar tissue that may have been blocking fallopian tubes and causing infertility. If an endometrial cyst is present on an ovary it can also be removed during the procedure. Before undergoing exploratory surgery for endometriosis however, the woman must consult with a gynecologist in order to know what to expect. During a laparoscopic surgery for endometriosis, the female s abdomen is inflated with gas which is injected with a needle. The surgeon will then insert the laparoscope through a device into the abdomen and examine the internal organs. The procedure usually lasts for approximately 30-45 minutes and may cause a woman to experience minor discomfort during recovery. Laparoscopy is usually done on an out-patient basis and therefore requires no hospitalization stay. The woman should be able to make a full recovery and return to normal activities within a period of seven days. When endometriosis has been causing serious pain and keeps a couple from trying to conceive, it can be very eventful to have the procedure done. Diagnosed with incisional hernia from hysterectomy, how soon can I get repair surgery?